WOULD YOU LIKE A COOL DB PREMIUM? WHERE SHOULD WE SEND YOUR PREMIUM? Copyright ©2019 Maher Publications. All rights reserved. 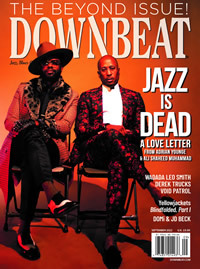 DownBeat is an internationally registered trademark of Maher Publications.